This week’s Food Matters recipe was selected by Jenn of Vanilla Lemon. The original recipe was for Corn-Avocado Salad (with a Little Something Seared on Top) and called for several ingredients that I ate during my trip to Peru this Spring. Creamy avocado, massive corn kernels, lime and fresh seafood are staples in many Peruvian dishes including palta rellena, jelea mixta, and ceviche–the latter inspiring my take on Bittman’s recipe. I ate a lot of ceviche in Peru. My favorite was a dish I ordered in a quiet restaurant in Huacachina–an oasis surrounded by 300-feet-tall sand dunes near Ica. 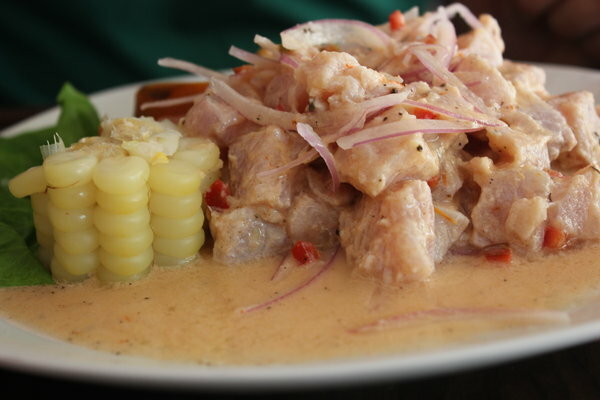 The tangy citrus flavor, typical of ceviche, was subtle in this dish, allowing the huge chunks of fresh fish to shine. The thin slices of red onions and sparse red pepper added an element of crunch and the spicy marinade added a refreshing kick that lingered in my mouth for just enough time. When altering Bittman’s recipe, I attempted to replicate the subtle tang, large chunks of fish and refreshing kick in the Peruvian Ceviche. Since Bittman’s recipe highlighted corn and avocado, my version of ceviche allowed the consistently delightful combination of sweet corn and nutty avocado to play a much larger role than in a typical Peruvian ceviche. Since I didn’t have sushi-grade fish, I opted to grill mahi-mahi rather than cooking it in citrus juice as is the usual method. In order to keep the traditional ceviche flavors with this cooking method, I marinated the mahi-mahi in orange juice, lime juice, and red chile paste for 30 minutes before I cut it into cubes, loaded them on skewers and grilled. 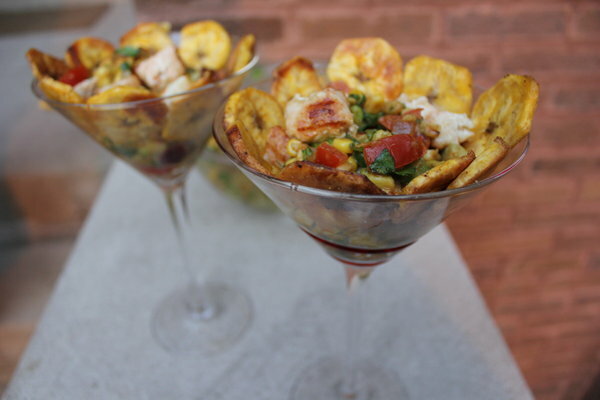 I served the ceviche to my friends with a side of plantain chips–I liked the combination so much that I never picked up a fork and ate the whole dish scooped up by plantain chips. You can see other other bloggers’ Corn-Avocado Salad renditions at The Food Matters Project. This recipe has a few different components, each of which can be made while the prior component cooks or marinates. Prepare and bake the plantain chips while the fish marinates, and prepare the corn-avocado salsa while the plantain chips bake. Whisk together juices, chile paste, and 1/4 teaspoon salt, until the salt has dissolved. Then whisk in oil. Season fish with the remaining salt. Place fish in plastic bag and pour marinade over the fish. Let marinate at room temperature for 30 minutes. When fish is done marinating cut into 1-inch cubes. Heat the grill to medium-high. Put 5-6 cubes of fish on each skewer. Grill on one side for 4 minutes. Flip and grill the other side for 3-4 minutes, or until fish is cooked throughout. Remove mahi-mahi from skewers and toss into the corn-avocado salad. 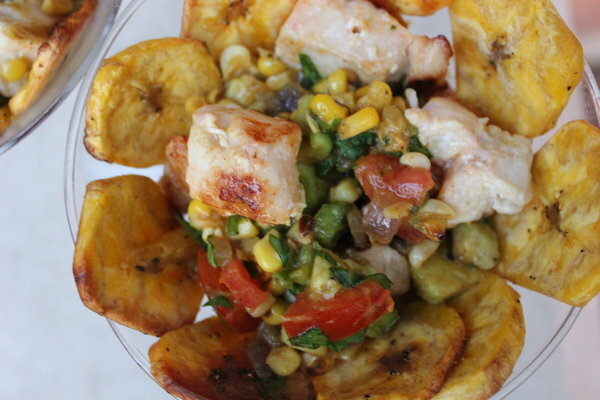 Serve the grilled ceviche with plantain chips. Pre-heat the oven to 375°F. Slice plantains slightly thinner than 1/8 of an inch. Toss with oil, salt and pepper. Bake for 25-30 minutes or until golden brown, flipping half way through. Heat oil in skillet over medium-high heat. Add the corn and onion and cook for 5 minutes or until corn begins to brown, stirring frequently. Transfer corn and onion to a large bowl and stir in chili powder. Add jalapeno, tomato, avocado, orange juice and cilantro, and sprinkle with salt and pepper. Toss well, taste, and adjust salt and pepper. Love your presentation of this salad. We just enjoyed plantains in Cuba last week, so I will have to look for them here at home. Thanks for sharing your alternative to tortilla chips! Very creative idea and so nicely presented. You’re dish is beautiful and looks delicious! Great way to make a dish to reminisce your trip! Sounds delicious, especially with the plantain chips! Love the plantain chips! I went ceviche too. I’ve never been able to master plantain chips. Yours look gorgeous, though! I’ll have to try those next time.